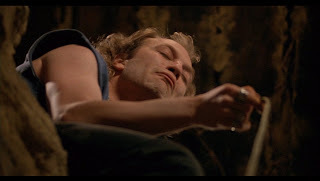 Jame Gumb (Lecter's/Satan's pupil), with rope in hand, lowers the waste bucket to Catherine Martin while she's in the well in his basement. Catherine tries to pull Gumb's dog into the well. 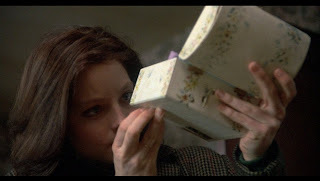 As described in part 43 of the Silence of the Lambs analysis, what we're supposed to do is pair this shot with the one above, in order to realize that Catherine's strings are being pulled by the Devil. Since Starling being in Gumb's basement corresponds to Catherine being in the well, Catherine represents, in part, Clarice Starling. Therefore, it is Starling's strings that are being pulled by the Devil. Since no rope is ever actually shown attached to any part of Catherine's body, the context of this 'pulling the strings' metaphor is one in which the 'strings' themselves are effectively invisible, i.e., there is a representation being made here whereby one entity is manipulating another, but this manipulation is 'hidden' from direct view. 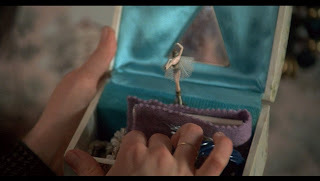 Starling looks in Frederica Bimmel's music box. The figurine of a woman is a marionette - a 'little little Mary'; it here represents Clarice, insofar as Clarice represents the Virgin Mary. Metaphorically speaking, Starling is here looking for the source of motion for the figurine - she is looking for 'that which moves her'. Since Clarice represents holiness itself, she also represents the Catholic Church. The white robe Clarice is wearing in the dorm room scene, indicates that she also represents the 'presence' of Jesus. 'Marionette' is also a name for a puppet operated from above by strings, like the one shown at left. [a] Recall that in the analysis of The Silence of the Lambs, many references to body parts and their sources of motion were uncovered. Also, as indicated in part 37 of the Silence of the Lambs analysis, the biblical book of 1 Corinthians, chapter 12, associates the members of the church with the parts of Jesus' body. Taking all of the above into consideration, what is ultimately being represented by this marionette metaphor is the belief that the members of the Roman Catholic Church are operating under the influence of Satan. Since Gumb is a 'pupil' of Lecter and represents the Freemasons, and Lecter represents a personification of Satan and the evil hermaphroditic Jews, this is another way of saying that the Catholics are being controlled by these evil Jews 'via' the Freemasons. Since, in addition to representing Starling, Catherine Martin also represents the general public (as indicated in the Silence of the Lambs analysis), the movie-makers must also be saying that the general populace is being manipulated and controlled by evil hermaphroditic Jews. a. 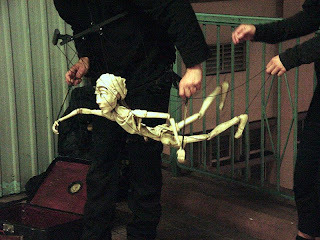 Image from the Wikipedia 'Marionette' page; Marionnette, by SoHome Jacaranda Lilau, Tamelifa Puppeters, Pierre S Frana Line, licensed under CC BY-SA 3.0 via Wikimedia Commons.